This is my character sheet, or design specification, for Moses. 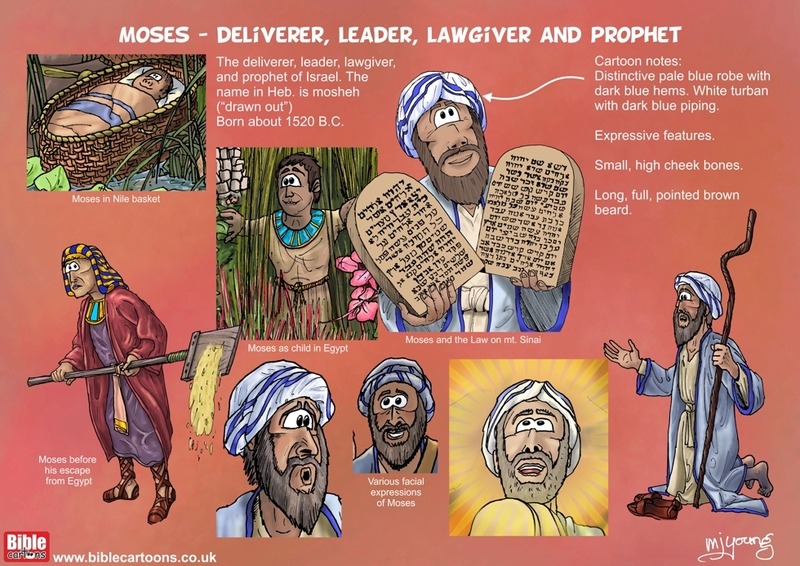 The purpose of this sheet is to keep a record of the attributes or characteristics of my drawing, so that I can draw a similar-looking cartoon in all future scenes showing Moses. I have included a brief personal history on the sheet as well. I first drew my version of Moses in June 2009, with the “Exodus 32 – Golden calf” picture. Although my style has changed a bit since those early cartoons, I try to maintain the same facial features, colouring and clothing style, so that the figure is recognizably that of Moses, even when months or years have elapsed between drawings. Moses was the deliverer, leader, lawgiver, and prophet of Israel. The name “Moses” in Hebrew is mosheh, meaning “drawn out”, attributed to Pharaoh’s daughter, who drew him out of the reeds of the Nile river. Moses was born about 1520 B.C. and belonged to the tribe of Levi, and was the son of Amram. Aaron and Miriam, were Moses elder brother and sister. Adopted by Pharaoh’s daughter, at age 40 Moses went into exile to Midian for killing an Egyptian. In Midian Moses took a wife, Zipporah and had 2 sons, Eliezer and Gershom. Here he met the Lord at the burning bush and was commissioned to save the Hebrew people from the Egyptians. Returning to Egypt with his brother Aaron, Moses confronted Pharaoh and after miraculous plagues, led his people on the Exodus out of Egypt towards the Promised Land. At mt. Sinai Moses responded to the call of the Lord, went up the mountain of God for forty days and nights, and received the Ten Commandments (Exodus 19:14-20:17) written on two stone tablets. Aaron created a golden calf idol for the people to worship as they waited for Moses to return. In a fit of anger Moses dashed the stone tablets to pieces before them. The Lord graciously gave the law to Moses again, on Mt. Sinai. Moses then oversaw the building of the Tabernacle and its preparation for worship (Exodus 35-40); received the Laws of God (Leviticus), and consecrated Aaron and his sons for priesthood (Leviticus 8-9). Moses numbered the people (Numbers 1); arranged the order of the tribes in the camp and on the wilderness march (Numbers 2); numbered and arranged for the special calling of the Levites (Numbers 3-4); and prepared for the onward journey of the Hebrew people (Numbers 9:1-10:10). Moses never entered the Promised Land, dying instead just outside it.